This training aid demonstrates a practical application of the kinematic relationships for a translating and rotating frame of reference. This demonstration should take 10-15 minutes. This lesson is an application of the previously developed vector equations for velocity and acceleration in a translating and rotating frame of reference. Assorted Military Vehicles and Toy Soldiers 1 $20-40 The essential pieces are tanks, cannons, and a helicopter. 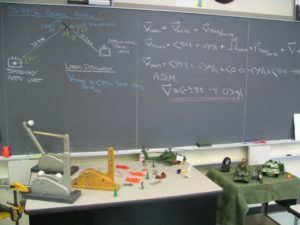 The cannons (artillery) are positioned at one corner, the helicopter is hung from the ceiling in the middle, and the tanks are on a moving cart on the other side of the classroom. The situation is developed that the scout helicopter (translating and rotating) uses a laser designator and “sees” the approaching tanks moving at a relative velocity at an instant in time. The question to be answered is to determine the absolute velocity of the approaching tank column (relative to the stationary artillery unit) and then to determine how many minutes are left before the advancing tanks are within range of the artillery. Tom Messervey (2017), "Armor Attack," https://www.handsonmechanics.org/dynamics/278.